C$30Care Package (First aid medicine, vaccination, bedding, etc). We begin this initiative in rural India, in places where there is very little or no existing help for street animals. These animals suffer in pain and agony, to no avail, due to limited resources in the region. Join us. We cannot do this without you. We want to show the invisible and forgotten stray animals of underdeveloped locations that there are still people who care about them. When you pledge to be a committed monthly or yearly donor, you pledge to be a Pillar of Hope. As an example, just $1 a day (or $30 a month) will give life-saving care to the animals in need. To take the Pillar Of Hope Pledge, please choose the "monthly" option in the donation box. 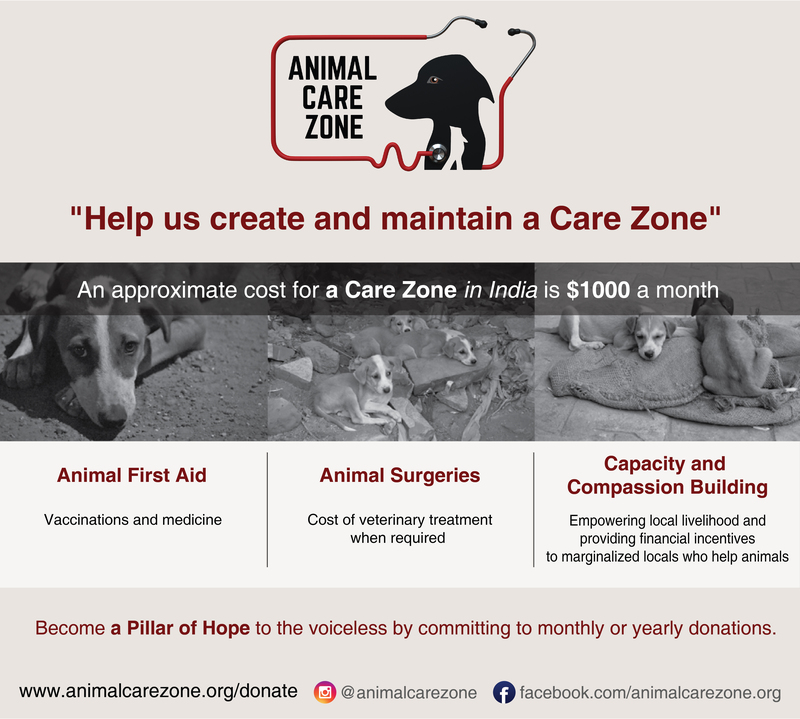 You can also select the "yearly" option and Animal Care Zone will distribute that amount amongst the 12 months of the year. As a committed monthly or yearly donor, you are a Pillar of Hope to all the neglected stray animals living in under-serviced areas who lack basic care. We are a Canadian registered not-for-profit organization. We appreciate your patience and understanding as we apply for Charity status in Fall of 2019.